When travelling in a vehicle, it is required by law that all persons over the age of 12, have to wear a seatbelt. Children under 12 years of age or under135cm in height, have to be in a suitable child seat, again by law. There are a few other exceptions to this law also which is mentioned further on in this seatbelt injury compensation guide. In the occurrence of a road traffic accident, wearing a seatbelt can save people’s lives or at least prevent the more serious injuries you may sustain in a crash. However, unfortunately, seatbelts can actually cause injuries too when in a collision such as seatbelt injuries of the spine or abdomen, or seatbelt injuries to chest muscles and so on. If you have a seatbelt injury and want to know if you can make a claim, read through our information guide to find out more. A guide to accident claims for seatbelt injury claims. What is a seatbelt injury? What are the dangers of wearing a seatbelt? Reasons why you should wear your seatbelt. What are the exceptions in the law for wearing a seatbelts? 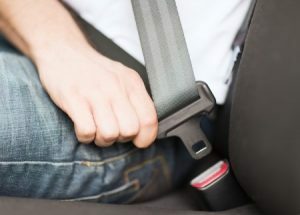 What to do if you are involved in an accident causing a seatbelt injury. How to begin a seatbelt injury claim. Seatbelt injury at work claims. What can be claimed for after an accident causing a seatbelt injury? The most common types of seatbelt injuries. Assessing the severity of a seatbelt injury. No Win No Fee seatbelt injury claims. Why choose us as your claims service for seatbelt injury claim? Although seatbelts are life savers and required to be worn by law, they don’t always come without their own risks. Seatbelts can actually cause injuries as well as save you from injury. Depending on how serious a car crash is, will dictate how badly you could be injured by your seatbelt. Whiplash is a common injury in road traffic accidents according to seatbelt statistics UK and could be put down to the use of a seatbelt. This is because the seatbelt holds the upper body tight whilst the head gets thrown backwards and forwards causing muscles in the neck to become torn and stretched. Abdominal injuries from lap seatbelts are common as the force of the crash is concentrated in this area due to the seatbelt. If you have suffered a seatbelt injury and want to know more about personal injury claims payouts, and if you are eligible to claim seatbelt injury compensation, then this guide should have all the information you need to go ahead and start making your claim. A seatbelt injury is where injuries sustained in a collision can be associated with wearing a seatbelt. Cracked ribs resulting in seatbelt injuries chest pain, seatbelt bruises, and other abdominal injuries can come from wearing a seatbelt. These type of injuries are suffered in the typical areas of the body that seatbelts cover when worn. The severity of the crash often determines how serious your seatbelt injuries will be. When a vehicle stops suddenly, for instance in a collision, a seatbelt is used to stop the driver or passenger’s body. Momentarily the body will still be in motion at the same speed that the car was travelling before it was suddenly made to come to a stop. This impact between the seatbelt and the body is when injuries such as seatbelt injuries to shoulder or collarbone can occur. Seatbelt injuries are more likely to occur or be worse if it is not worn in the correct position, or there is a seatbelt malfunction, or a defect with the seatbelt. If seatbelts are worn properly and they function as they should, then seatbelts can and will save lives and prevent serious road traffic accident injuries. However, this isn’t always the case unfortunately and so there are a few dangers. Retractor failure – During a collision, this mechanism is supposed to lock and not give any slack at all so that the seatbelt holds snug against the person, preventing them from moving forward. If the retractor / locking mechanism malfunctions, the seatbelt may be too slack causing the body to slam into the belt rather than be held in place or back by it, resulting in injuries. Internal latch – With certain buckles, if the back of the buckle gets hit, it can become unlatched and so resulting in not holding you in place like it should and so injuries may occur. Release button – Some seatbelts have a button that sticks out and is too easy to knock. If knocked, there’s a chance it could become unlatched without the passenger knowing and so if there is an accident, the seatbelt won’t do its job properly. Design defects – Some seatbelts are only effective if worn a certain way, if they are not worn quite as they should be, they can cause more injury. Injuries sustained from wearing a seatbelt can be minor, like bruising, to severe such as, internal bleeding in the abdomen, severe trauma to the neck and spine. However, although there may be some risk, the fact of the matter is, seatbelts save lives, statistics show it is better to wear one than not. Stops you from hitting the windscreen, or if a rear passenger, stops you from hitting into the person in front of you. Stops you from being thrown around inside the vehicle. Stops you from being thrown out of the vehicle. Pregnant women are more protected if they are wearing a seatbelt. They work hand in hand with airbags making them more able to give protection by holding you in place during a crash. Seatbelts are the best defence against things not in your control such as distracted, aggressive or impaired drivers. If you are supervising a learner driver whilst they are reversing, or if you are reversing yourself, you do not have to wear one. Police, Fire and Rescue services don’t require you to wear a seatbelt. A licensed taxi driver that is trying to pick up passengers. A delivery driver who is travelling fewer than 50m between each stop. If you are investigating a fault in a trade vehicle and are a passenger. If you have been issued a Certificate of Exemption from Compulsory Seat Belt Wearing by a Doctor. 2016 marks a 50 year anniversary of the seatbelt 1966 legislation that was brought in to make it a legal requirement that all cars had seatbelt fittings put into the front of cars. However, it was not compulsory to wear the seatbelts until 1983. This legislation really changed the way people thought about their safety whilst in a vehicle and in 1986, it was made compulsory for back seat passengers to wear seatbelts as well due to seatbelt statistics showing that seatbelts were saving lives. So all cars had to have seatbelts fitted to the back seats and all new cars being produced had all the fittings in place. However, cars made before 1965 were exempt from these new requirements. In a road traffic accident, you are actually twice as likely to die if you do not wear your seatbelt. Seatbelt statistics 2016 show that for the last ten years, 90% of people have been wearing their seatbelts with 98% of drivers wearing theirs in 2014. Photos – Take any photos you can of your seatbelt injuries you have sustained. These provide visual proof of your pain and suffering. Proof of expenses – Keep any proof of costs that you may have incurred as a direct result of the accident and the injuries you have sustained. These would include prescription fees, travelling costs, counselling costs etc. Medical report – Make sure you see a medical professional to get your seatbelt injuries assessed and documented. A report will be made that will not only list your injuries but will include recommend treatment and expected recovery period. This will be used to determine the amount of compensation you should receive. Third party details – If there were other people involved, get their details such as name and phone number if you can, but certainly details such as make and colour of their vehicle and the registration number. This is particularly important as they can be traced with just their car details. Write it down – Whilst it’s fresh in your mind, write everything you can remember about the accident down, particularly making note of how your seatbelt was positioned and whether you noticed anything wrong or that felt wrong with it. Making a seatbelt injury compensation claim can be quite complicated as finding who or what is to blame for instance, isn’t always very straight forward and is usually quite complex. By using a service such as ours, you won’t need to worry about trying to understand all of the legal jargon as we have decades of experience of dealing with these types of cases and will know exactly how to deal with yours, making sure you receive the compensation you deserve. So, what do you need to do next? You can call us. We offer a free consultancy session where you can ask as many questions as you need to with regards to making your seatbelt injury claim. We’ll also take the opportunity to get some information from yourself with regards to the details regarding the injury you have sustained. Once you are happy that we have answered your queries and hopefully put any worries to rest, and we are certain that you have a case, we will make a start on your seatbelt compensation claim. You’ll be pleased to know that all of our specialist claims lawyers work on a No Win No Fee basis and so there is absolutely nofinancial outlay for you and therefore no unexpected bills. You only pay our legal fee when your case is successful. Occasionally a local medical needs to be arranged. It is nothing to worry about, we would arrange this for you at a clinic local to you and it wouldn’t cost you anything. We can discuss this further during your free consultation if you have any concerns. If you have had an accident whilst driving a works vehicle in work time that has resulted in a seatbelt injury, then you might be able to make a seat belt accident claim. However, depending on the circumstances you could claim from the driver who is at fault, or if your injuries are found to be due to a malfunction or defect of your seatbelt, then your employer might be seen as liable and so you would claim from them. The accident could also be down to the seat belt manufacturer. This is where our expertise and efficiency can really help you to have a good case to get you the compensation you are entitled to. There are so many variables on who could be found liable when injured at work we’d strongly advise contacting us today. General Damages – This refers to the amount of seat belt injury compensation you will receive that reflects the pain and suffering you have experienced. Medical Expenses – Any costs that you have due to the result of your injury, you can claim for. So any prescription fees, or counselling costs or such like, can be included. Loss of Earnings – This refers to any loss of income the injuries sustained and also covers the loss of any potential future earnings. Travel Expenses – Any costs of travelling to and fro the hospital, any vehicle adaptions and any alternative travel costs should be included. Weakness – If there is damage to the abdomen, spinal nerves or lower back, the legs may feel weaker than normal, and also in general, you may feel weaker and suffer dizziness which could be a symptom of shock or internal organ damage. Breathing Difficulties – Due to the pressure of the seatbelt on the chest, you may feel breathless and have trouble breathing if you have suffered damage to vital organs such as the heart and lungs as a result of seatbelt injuries to chest muscles and / or seatbelt injuries to sternum. Bruising – During a crash, the seatbelt pulls tight as it locks immediately and the area that it covers can have muscle strains and be bruised. Quite often there is swelling and sometimes skin discolouration but these usually go after a few days. Bleeding – Internal damage caused by a seatbelt can be indicated by noticing blood in the urine or stools. This is because damage to the bladder or urinary tract may occur due to the seatbelt compressing against these areas. Also, any changes in urinary or bowel movements should be noted by accident victims. Endometriosis and colon obstruction can be caused from seatbelt trauma. Stomach problems, respiratory tract or lung damage is possible from seatbelt trauma of which coughing up or vomiting blood could be an indication. Abdominal Pain – Pain across the abdomen and in between the hips and ribs results from the seatbelt being pulled tight during a crash across the kidney area. Sometimes, the kidneys can suffer some damage and if left untreated, could become infected, have delayed bleeding, and also possibly result in kidney damage. Internal blood loss could result in anaemia and low blood pressure. Stiff Neck – Sometimes it isn’t just the pressure of the seatbelt on the body that causes seatbelt injury. The fact that the seatbelt holds you in position in the event of an accident means that other areas won’t stop moving. If the head, for instance, flings backwards and forwards whilst your torso is being held in position, this can result in whiplash which is where the muscles of the neck become stretched and ligaments torn causing stiffness in the neck. In severe cases, a spinal cord injury could occur due to forceful whiplash. Seatbelt injuries aren’t always that easy to judge when deciding how severe they are and what effect they may have on the claimant in the future. In the majority of cases, the claimant will need to have a medical assessment carried out to see how bad the set belt injury is and if any treatment is required and for how long. It is a small, simple examination we can arrange to be carried out in a local medical centre at no cost to the claimant. How much can I get after an accident causing a seatbelt injury? Although all seatbelt injury compensation amounts will vary from person to person due to individual pain and suffering and other various factors, we have provided a table below providing the avearage compensation amounts paid for different injuries that might be present in a seat belt accident claim. Loss of earnings £10,000 - £400,000 Income lost will be considered as well as potential future income. There is a chance for a higher payout than the maximum based on the future earning potential of the claimant. Loss of benefits £5,000 - £500,000 This payout is based on the actual income lost, and again, there is the chance for a higher payout than the maximum depending on the claimants current pay grade. Pain and suffering £1,000 - £200,000 How much compensation the claimant receives depends on how much pain and suffering they have experienced. Severe chest injuries £76,500 - £114,100 This refers to serious heart or lung damage. Pain and suffering will be ongoing. Less severe chest injuries £9,575 - £13,650 This refers to cases where the chest damage is relatively simple, but may have some minor permanent tissue damage, but no long term effect on the function of the lungs. Minor shoulder injury £350 - £6,700 Pain and restriction of the arm as a result of the injury that is short term. Moderate shoulder injury £6,250 - £9,750 Pain and reduced movement of the arm. Severe shoulder injury £9,500 - £37,000 Pain and reduced movement of the arm. Minor neck injury £1,800 - £6,200 Short term damage to the neck such as whiplash causing pain. Severe neck injury £35,500 - £112,450 Severe pain and reduced movement, possibly even paralysis. Minor back injury £350 - £9,850 Temporary damage to the back with pain that is short term. Moderate back injury £8,750 - £30,750 Permanent damage to the back causing long term pain thats ongoing. All of our personal injury solicitors work on a No Win No Fee basis. In a nutshell you will not need to pay anything until your claim is made successful. If your claim wasn’t successful, you wouldn’t have to pay us anything at all. Making any sort of injury claim due to a seat belt accident can be a long, tiring process and if you choose to work with a solicitor who is paid by the hour, you could end up with some large legal fees without any guarantee that compensation will get paid. With No Win No Fee you really have nothing to lose and there is no financial gamble working with us. There are many personal injury law firms but we believe that you wouldn’t find a better firm than ours to secure your seat belt injury compensation claim. We have years of experience specialising in personal injury claims such as yours. We have a fantastic track record of making successful claims for maximum payout amounts for our clients. We are honest, reliable, caring and won’t let you down. We understand that you are going through a tough time at the moment and will do our best to make the process of your claim as simple as possible so you don’t have to deal with any extra stress or worries. We will keep you informed every step of the way and will focus on securing your compensation, whilst you can focus on taking care of yourself and your recovery. If you have any queries regarding seatbelt injury compensation or believe you may be entitled to claim, please do not hesitate to call us on 0800 073 8804. Your call will be answered by a member of our professionally trained team who will help you in any way that they can regarding your claim. They can answer your questions and explain the next steps in the claiming process and begin launching your claim to secure the payout you deserve. UK government website listing the pros and cons of wearing seatbelts. This link takes you to another of our pages focusing on car accident claims.